The oldest pieces of jewellery made by modern humans have emerged in Africa. 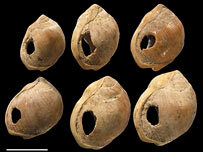 Shell beads found in Blombos Cave on the southern tip of the continent are 75,000 years old, scientists say. The pea-sized items all have similar holes which would have allowed them to be strung together into a necklace or bracelet, the researchers believe. Christopher Henshilwood and his team have told Science magazine the find is probably one of the first examples of abstract thought seen in our ancestors. "The beads carry a symbolic message. Symbolism is the basis for all that comes afterwards including cave art, personal ornaments and other sophisticated behaviours," Professor Henshilwood, of the University of Bergen, Norway, told BBC News Online. "Even in today's world, where you're talking about computers - it's about storing information outside of the human brain. 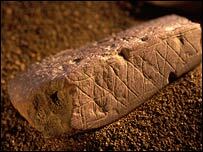 The evidence from Blombos Cave is that humans were using symbolism 75,000 years ago." 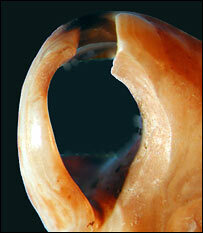 Until now, the oldest beads in Africa date to about 45,000 years ago. The 41 Blombos shells were found in clusters of up to 17. They come from a tiny mollusc scavenger, Nassarius kraussianus, which lives in estuaries. This means, Henshilwood's team says, they must have been carried to the cave as the nearest rivers are some 20km away. The shells appear to have been selected for size and deliberately perforated - the shape and position of the holes are the same on all them. "The leather or the twine that was used [to hold them together] has left a very distinctive wear pattern on the shells," Professor Henshilwood said. "Also where the beads have rubbed against each other on the necklace or bracelet, it has created a facet - a flat area around the mouth of the bead - and that is totally unlike any facets you would find in a normal population of these shells." Traces of red ochre on the shells also indicate that either the beads themselves or the surfaces against which they were worn were coated with the iron oxide pigment. It was at Blombos in 2002 that some of the same scientists announced the discovery of chunks of inscribed ochre and shaped bone tools. These objects dramatically pushed back the date for the first, clear instance in the history of humans for the use of symbolism - the behaviour that would appear to set our animal species apart from all others. There are claims for even older items, dating back 200,000 years or more, that comprise mainly rock objects apparently sculpted to look like the human form. But many sceptical researchers believe these objects are merely accidents of geological processes, and doubt they have been intentionally modified in any way by human hands. Scientists tracing the origin of our sophistication would like to know not just the time when our use of symbolism first emerged but also how rapidly this ability to conceptualise developed. Many researchers believe the use of decorative objects such as jewellery grew out of the need to identity individuals - to determine which social group a person belonged to, or their status within that group. Professor Clive Gamble, from the UK's Centre of the Archaeology of Human Origins, told BBC News Online: "It's all about identity - about changing the way you look. "I'm sure clothing also came along in a big way at the same time. And then there's all that ochre. These people were interested in changing their colour."